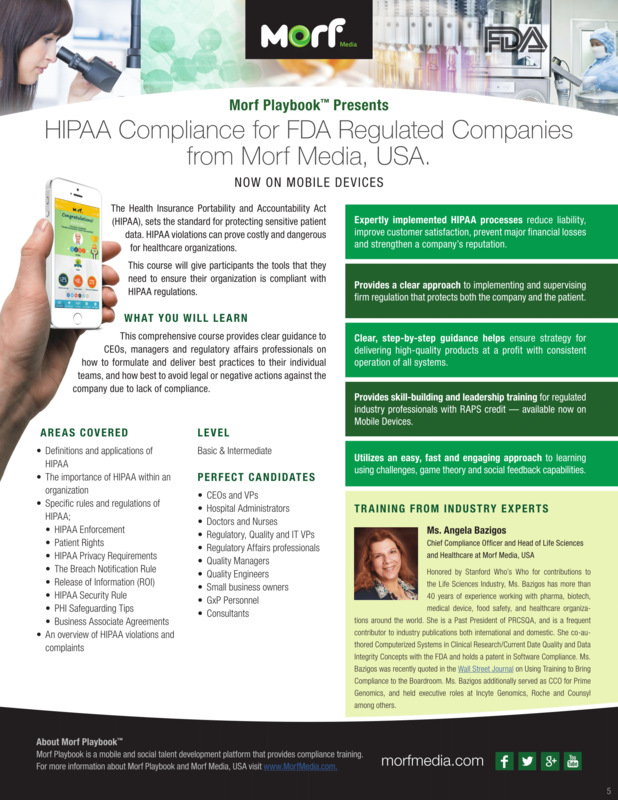 Morf Media Inc., developer of Morf Playbook™ talent development, skill-building and compliance training platform for use on mobile devices and PCs, today launched its latest online course, 2016 HIPAA Best Practices. Updated with latest guidance on National Instant Criminal Background Check System (NICS) Information and on cybersecurity best practices, the interactive course provides a clear, effective approach to correcting and preventing mistakes and leaks in confidential medical information. The 2016 HIPAA Best Practices course shows healthcare providers how to lower the risk of regulatory action through up to date HIPAA compliance training. Recent legislation, specifically expectations regarding electronic Protected Health Information (ePHI) and Electronic Health Records (EHRs), implemented stricter privacy regulations when storing and transferring patient information. Complete training in the details of these new guidelines helps companies avoid steep fees and legal issues. On Jan. 4, 2016 HHS released a final rule (federalregister.gov) that modifies the existing HIPAA Privacy Rule to clarify that it is not a privacy violation to report certain information to the National Instant Criminal Background Check System (NICS). Importantly, the rule does not apply to most health care professionals and does not allow diagnostic, clinical or other mental health treatment information to be reported.